The holidays are a time when many families will be flying, but for whom flying might be something done infrequently enough that it can be a stressful experience. 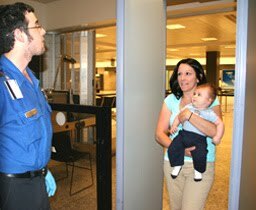 If you are one of these families and you're headed to a holiday timeshare rental vacation or family get-together, knowing ahead of time some of what to expect in managing your children at the airport security check can help things go smoothly. Our 2-Part article offers tips directly from the Transportation Security Administration on traveling with children. The Transportation Security Administration (TSA) is the government agency that has the responsibility of protecting the nation's transportation systems so you and your family can travel safely. To that end, with the high terrorist threat that the country is now under, airline passengers must be screened prior to boarding an aircraft. That includes everyone, even babies and disabled children. Many people question the need to include children in the security check, but the TSA has examples of box cutters being hidden in baby carriers, knives hidden in babies' diapers, and the like. Part 1 looks at what to expect when passing through security with children. If your child can walk without your assistance, you and your child will be asked to walk through the metal detector separately. If you are carrying your child through the metal detector and the alarm sounds, the security officer will have to additionally screen both you and your child. Do not pass your child to the security officer to hold. The security officer may ask for your help screening your child. Medications, baby formula and food, breast milk, and juice are now allowed in reasonable quantities exceeding 3.4 ounces (100ml) and are not required to be in the zip-top bag, but must be declared and offered for inspection. Separate these items from the liquids, gels, and aerosols in your quart-size and zip-top bag. Declare you have the items to one of our Security Officers at the security checkpoint. Present these items for additional inspection once reaching the X-ray. These items are subject to additional screening. You are allowed to bring gel or liquid-filled teethers, and canned, jarred, or processed baby food in your carry-on baggage aboard the plane.